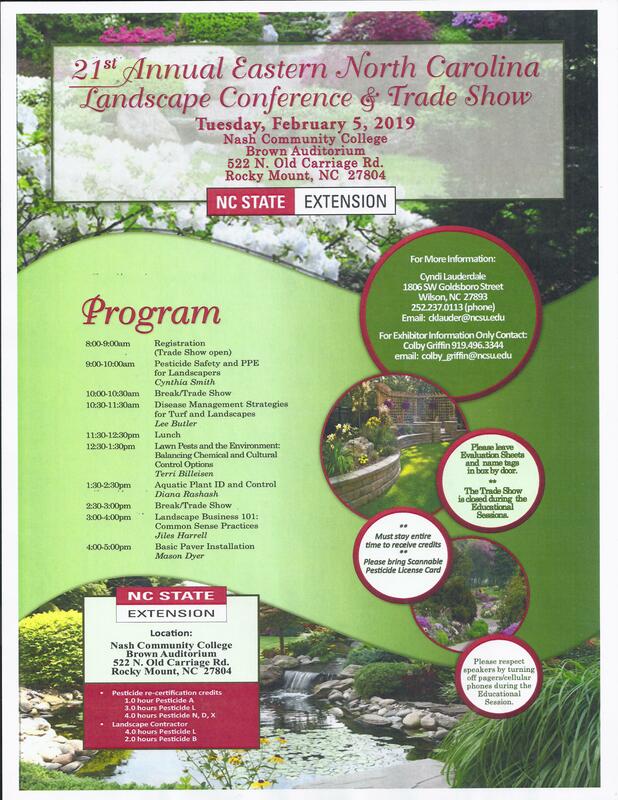 This Landscape Conference and Trade Show will focus on a number of topics including pesticide safety, disease management, lawn pest, aquatic plant ID, basic installation paving and much more. Pre-registration is preferred and is $30.00 if postmarked by January 28, 2019. There will be no pre-registration after January 28, 2019. Participants may pay $40.00 at the door. Contact Cyndi Lauderdale at 1806 SW Goldsboro Street, Wilson, NC 27893. Phone 252-237-0113 or by email at cklauder@ncsu.edu. For exhibitor information only, please contact Colby Griffin at 919-496-3344 or by email at colby_griffin@ncsu.edu. Please print the conference registration flyer, which includes a detailed agenda. The agenda is also found below. Please note the Conference will be held at Nash Community College located in the Brown Auditorium. The address is 522 N. Old Carriage Road, Rocky Mount, NC 27804. *Please note: You must stay the entire time to receive credit. Please bring Scannable Pesticide License Card.